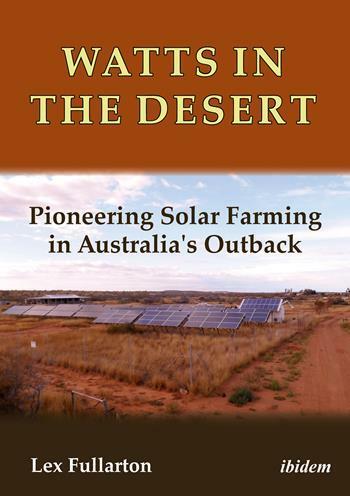 Last month I was very pleased to receive a copy of 'Watts in the Desert: Pioneering Solar Farming in Australia's Outback', a book written by Lex Fullarton with a chapter co-authored by yours truly. Lex Fullarton was the 'solar champion' in one of my research communities, Carnarvon, and acted as the central figure in one of my thesis chapters. 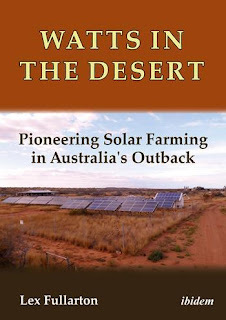 I was very pleased to find out he was writing a book detailing his journey promoting solar electricity generation in regional Australia, and even more so that he was interested in including some of my research in his book. My research can be found in Chapter 5, outlining the social impacts of the 'Fruitloops', an informal solar community organisation in Carnarvon. It just goes to show you that you can find collaborators in the most unlikely of places! 'Watts in the Desert' is available in good academic bookshops, through Columbia University Press distributors, online through OneSearch and at WA university libraries.